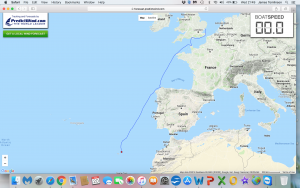 The voyage so far ..
Weighed anchor at 1440 BST and set sail for Madeira. By midnight we were 7NM NNE Cape Vilan. 1610 BSTWell this just might be it! What I’ve been preparing for … for so long. What me and ‘Talisker 1’ have done together since 2014. But it could all stop and go on hold. 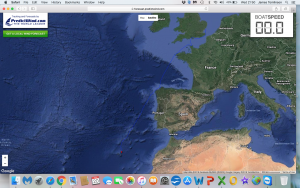 There is still 50 miles to go before we clear the NW coast of Spain and set off in to the Atlantic so …. And the wind is not that strong and should drop some more this evening. 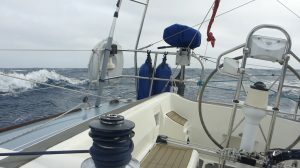 Just approaching Finisterre and then we will start to edge away from the land and out in to the Atlantic. It’s 0100UTC so 0200BST as I type this. 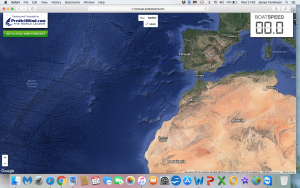 At 0500 UTC we were 15 NM west Cape Finisterre having sailed all the way from Cedeira. 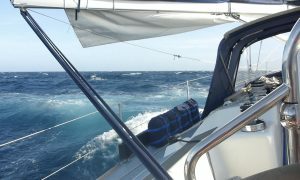 0925 Finally ran out of wind but there should be some quite soon and then we will be making headway. 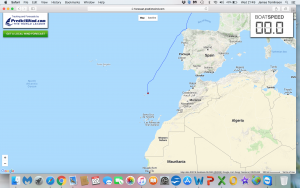 Just S of Finisterre TSS and just trying to set west of shipping before making a course for Madeira. Got clear of shipping 0 wind. 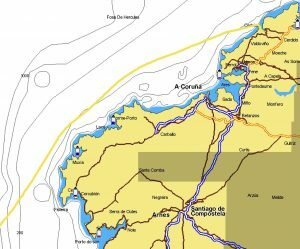 Tired having messed with coastal passage to Finisterre, shipping etc. Finally motored S knowing the wind was ahead of us … just ahead of us. And then it came 0 – 25 knots from the N just like that. Careful what you wish for! 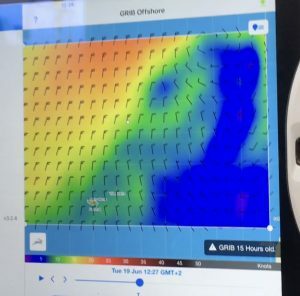 Of course there was more wind on the coast but wanting to get clear of traffic and the shipping too we edged out to sea eventually clearing the shipping at 1100 UTC when the wind died and stayed that way until 1330 when what was expected finally arrived. So! Wind off the starboard quarter. 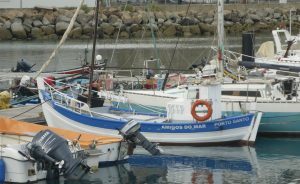 Small Genoa poled out on port. Main with a reef and stay sail on starboard. 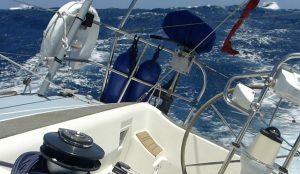 Blowing about 20 – 25 knots. Making Progress 16th 1900H. I’ve had to furl the stay sail by now. It’s blowing a hard F6. 0900 UTC 150 nm NW Lisbon. 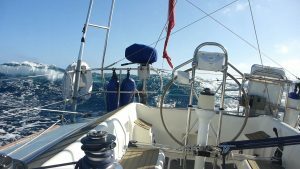 The wind is consistent from the north 20 – 25 knots. The sea was hard work but now the waves are lengthening and becoming consistent. 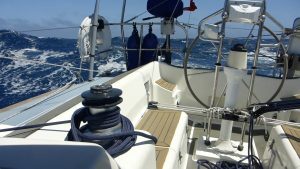 I have a handkerchief of Genoa poled out on port and a triple reefed main on starboard. It’s rough. Now I’m feeling the tiniest bit more comfortable. Doc! You said the first 48 hours were not good … well I understand now. There is the occasional thump from a wave against the hull but she is well balanced and her stern just lifts to meet each wave. I feel as though I’m in a lift. We are making 6.5 to 7 through the water, with readings reaching double figures. And more over the ground. 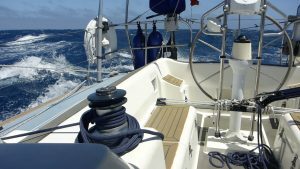 We are headed for Madeira some 500 NM away (3 more days) but it would be just as easy to make for Cape St Vincent. Beautiful sun, blue sky and a spectacular ocean. And I’m slightly less frightened now. Now fairly settled at midday. Lovely message from James Robinson. I’ve been hearing choir music! Mad! Your the best Commodore. I’ve already turned 10 degrees to port. I can see the weather..
Self steering working very hard and running the engine to top the batteries up. Looks like landfall Wednesday late morning. 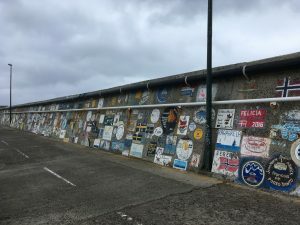 Madeira. 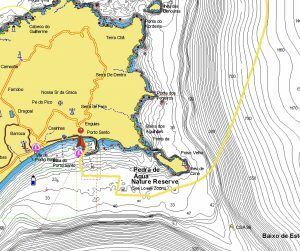 Cabo de Roca Europe’s most western point is 185 NM ENE of Talisker 1. 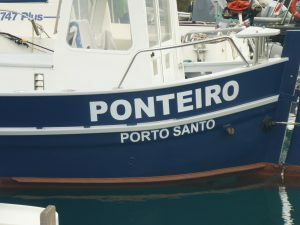 Porto Santo is 340 NM SSW..
We are doing 180 + NM 24 H runs in these winds. N with a tiny pinch of East and consistent 25 knots. Sea rough and sloppy. Into a routine now. How do you forget being told that you won’t settle for the first 48 hours? Doc, confirmed by John Pennington who says it always happens to them. Reading, eating when hungry, sleeping as and when I feel the need with AIS Radar alarms set to guard. 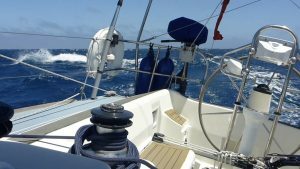 We are 150 NM from Porto Santo. On our current course there will be little wind by early afternoon so we’ve altered course 30 degrees to starboard on to a starboard tack to try to stay with some breeze. 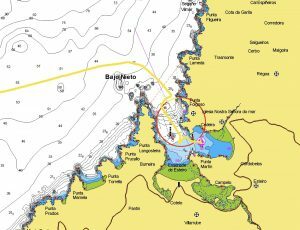 The wind should then back NNE later on this evening which eventually, hopefully, will have us running down on to Porto Santa in the morning in a north easterly. It’s all flattened out and it’s so overcast it could be the N Sea. Nah! Only kidding! There is still the long swell and the dark inky blue of the Ocean. We are not riding over 60 metres here. But days of a big following sea have been quite something for this ocean rooky. Go below and fit washboards, close hatch, lie down for half an hour, eat or sleep. It all seems peaceful and quiet as you listen to the ship uncomplainingly working. Slide open the hatch and look behind at the advancing waves and the noise and you go what the fahk? Mind you! I could have been briefly over 150 metres with consequences. Got a lovely email from my friend Raymond Basteels, SV ‘Drunken Duck’. Had I seen shallow water at 36 38 N 14 13 W? The little alteration if showing on my track at 1615 was to take an even wider berth of this spot. 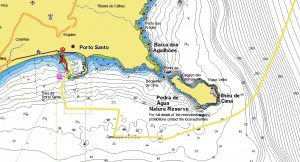 Navionics charts, despite covering Portugal Spain and the Atlantic Islands miss out great chunks of Ocean. Paper charts show this important stuff. 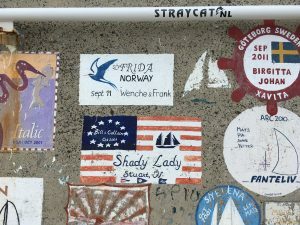 I’ve seen and talked to ships outward bound from the Med to the States. The one I spoke to altered course to pass astern of us. One heading north was on a direct collision and she altered course to pass port to port. Nothing else since 0500. I certainly pen and ink. I have not been ashore since L’Aber Wrac’h. I’m as mean as hell with water. Miserly in fact. I don’t really have to be but … there is also a 20L Jerry Can. Baby wipes do all that washing business. Out of veg and tomatoes. Apples and bananas plenty still. There is enough food for weeks. 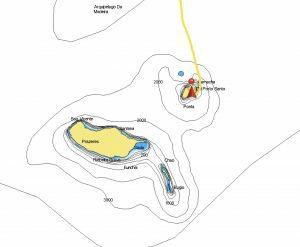 We are 40 NM from Porto Santa Island. Hopefully we will be berthed in the harbour mid afternoon. The light northerly winds are running us south and for the second day in a row it’s overcast. I’d hoped to see Madeira from perhaps 40 miles away. Anyway! 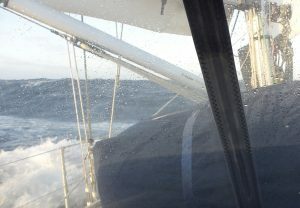 750 NM from Cedeira and here we are our 5th dawn at sea. My only gripe is running the engine daily to charge the batteries. The engine is running now. But the last two days of overcast has resulted in very little solar energy. Just keeping up with the ships systems rather than a full recharge. And no Madeira courtesy flag!! Will I be arrested? Will flying a Portuguese courtesy flag be worse. 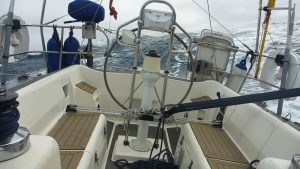 800 NM in five days + a couple hours. I’m utterly humbled by the experience. All the training 60 N around Shetland and Norway cannot prepare one for sailing in the Atlantic Ocean. The vast wilderness. The strength of the Ocean and the total insignificance of me and my tiny boat against its might. It was a wonderful experience. Beautiful. And once through the first 48 hours, routine set in and I caught up on sleep so by the time we arrived here last night, engine off 1615 UTC, I was feeling pretty sharp. 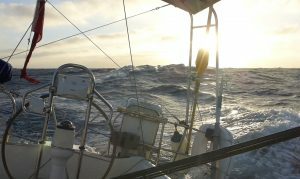 The wind dropped significantly as we closed the Islands and the last 12 hours was spent keeping the ship moving forward in very light winds from the north, the sails flogging, as the swell rocked the ship. You proper long distance sailors have to find a way to cope with this frustration! 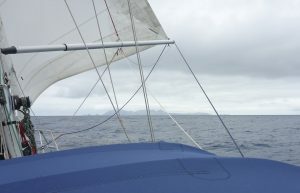 Not at the lack of speed, because that’s not important on a long passage, but watching and listening to the sails getting a beating. 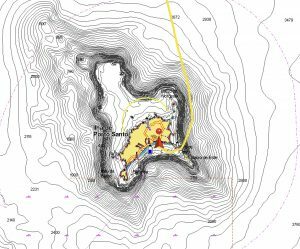 I was so hoping to see land from 40 NM but the overcast that had lasted 48 hours prevented land not being sighted until 24 NM away. Steadily it grew. This lump of volcanic rock sticking up from the Ocean floor. A huge mountain if you took the water away. It was lovely getting that bit of acceleration from the wind off the land coming down the east side of the Island (not so good if really windy) as the sun came out, the sea turned the most beautiful blue and in less than a mile rounding the south eastern tip of Porta Santa the ocean climbs almost vertically from thousands of metres to … and hey our depth metre is reading again 50, 30, 25 and we are in the lea of the island and in the bay of the port of Porta Santa but despite that with gravity fed strong gusts of katabatic wind coming down off the high mountains on to a flat calm bay. I phoned my Mum. 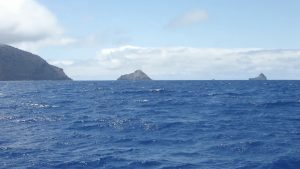 I wanted to describe the island and to let her know we were about to reach Madeira. She was full of beans and of course I have been here before! With her, when I was 5 months old! She’s been back since when she took a cruise, with my then x mother in law, from Portugal to South America after my Dad died. Now make it safe arrivals! There is no hurry. The genoa is furled and lines stowed. We continue to sail under main alone. Preparing to lower the sail I realise I’ve forgotten to unstrap the stack a pack and raise it. Having done this I start the engine, turn in to wind and lower the sail and stow it carefully. Go slowly … no hurry. This is not the time to make a mistake. Making everything tidy and stowed in the cockpit for a single hander is important. Moving around the cockpit when approaching and berthing you don’t want anything to trip you. That’s why I keep the cockpit as tidy as possible when underway. I call up the marina and speak to a lady. Her English is not good. My Portuguese non existent. My colleague will be in the marina to meet you. 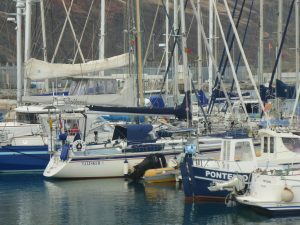 Do you require a pontoon berth? Can he help me I’m on my own? That bit defeated her for translation. The wind in the marina from the hills so close is strong. You don’t quite realise it. It took full reverse to halt her as she came in to her berth and a lovely Portuguese HM was busily making us fast while giving me incomprehensible instructions. The kind HM took me to the Harbour office where I was given a key for the showers and was introduced to the immigration passport officer. Come back later when your all washed and settled he told me. I decided to get it all done and returned, having secured the ship properly, and did all the formalities while we discussed the world cup. You were at sea on your birthday? These guys look at DOB in passports. Come and see me to say bye before you leave. No need to bring papers. Just let me know when your leaving. Then a chat with Sally. And then a lovely shower. There’s a restaurant café in the harbour and I had supper in there and watched a little of Spain Iran. A very pleasant end to a very important day for me and my little ship. Oh … and the islanders call themselves very much Portuguese. Congratulations! 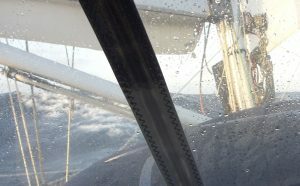 Ship and crew taking the long run of challenging conditions in stride… And not to mention a blazing fast passage! Thanks John and Sentijn. But a trip like the one I’ve just done is a walk in the park for folk like you. Well done James, a great account, what a trip, very good skills indeed …. Not knowing where you were heading, it was fun watching your track. What a brilliant journey. Where I’d next. We have managed Titchmarsh marina! Yes! But you’ve done it all already. You have nothing to prove to anyone. Not least yoursleves. Thank you so much. Wow, well done James what a trip. Because I M rubbish with social media I have missed your voyage. However, now hooked. Brilliant good luck and fair winds. Thank you Master! And I mean that in every sense of the word. Whoohoo!! Ticked that box in great style James and Talisker1. What an achievement and great adventure. Keep em coming. Cheers from Tipaniacs. James Tomlinson on Moving ‘Endeavor’ A Sad Delivery! jon smith on Moving ‘Endeavor’ A Sad Delivery! Copyright © 2019 Samingo Sailing. All Rights Reserved.